I'm Running to Eat! : A Breakfast Feast! We don't *do* breakfast around here. Oh we *eat* breakfast. We just don't sit down and do it all at the same time. The kids get up way too early on the weekends or dh and I are off for our group runs before sun-up and so while we always eat dinner together, we never have breakfast as a family. For the most part breakfast is usually cold cereal, toast or bagels (hopefully) made while mom is sleeping in. ;-) The other night while we were preparing dinner, Lily asked why we never have a breakfast feast. 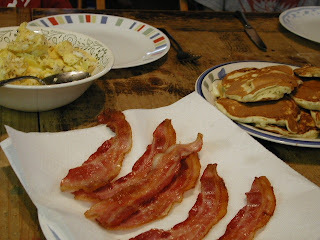 Since there really wasn't a good reason, we decided we should have a "Breakfast Feast" soon. In a bowl, mix together all the dry ingredients. Make a well in the center and pour in the milk. Start with 1 1/4 cups milk, adding up to another 1/4 cup if necessary, as you mix it with the flour. Add the two eggs, vanilla if using and oil, whisking until mixed but still a bit lumpy. Heat a frying pan (if it is not non-stick, you will need to melt a bit of butter or oil in it) and when hot, pour in some pancake mix. How much depends on how experienced you are at flipping pancakes and how big you want them. We do about 1/4 cup a time for small, easy-to-flip pancakes but you could make this as much as 1/2 cup of pancake mix. If you are adding fruit, I like to sprinkle it on top of the pancake now. The first pancake is always a bit of a test so adjust the batter by adding more flour if you need to make it thicker or more milk if you want a thinner pancake. In either case, just add a few spoonfuls at a time until you get it right. Repeat the cooking process with the remaining batter. You may need to adjust the heat as pan tends to get hotter as you keep making pancakes. Keep the cooked pancakes covered with a tea towel, to keep them warm while you finish cooking the rest.